8 movies to take the kids to watch this school holiday! 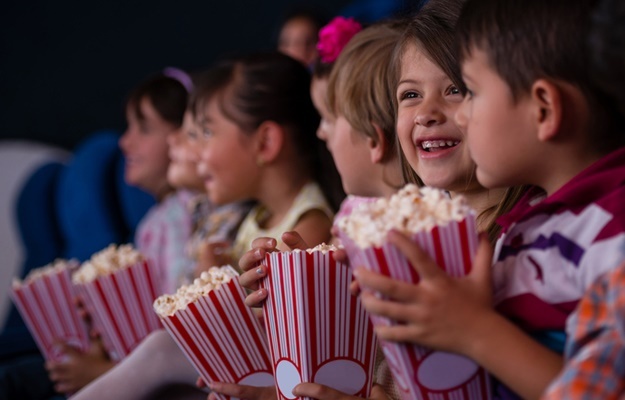 Taking the kids to the movies is a great way to keep them entertained and out the house for a few hours! Here's what to expect on the big screen these coming holidays. I can still remember my first trip to the movies. The dim lights, the popcorn and chilly, brightly coloured slushy were all part of the fun. I still feel like that 6-year-old girl who went to watch Babe: Pig the City every time I go to the cinema. No matter how many streaming sites, DVDs and TV movies there are, nothing beats going to the movies. There is a good selection of movies that the kids can choose from this Easter holiday. From animation to teen sci-fi, the whole family will be able to find something to enjoy. Will Gluck brings the beloved children's book character to life in the 3D live action film based on Beatrix Potter's classic tales about Peter Rabbit. Peter loves spending his days with his cousin and triplet sisters, lounging in horrid Mr McGregor's garden and hanging with a friendly lady named Bea, who paints pictures of the rabbits. When Mr McGregor dies in a terrible accident, his house his inherited by his mean and bitter nephew Thomas. Thomas and Peter will bump heads but can they put their differences aside for Bea, who finds herself falling in love with Thomas? Chloe is a moody teenage girl who's angry about moving AGAIN! The new house that she and her mother move to seems to be inhabited by garden gnomes, or "tiny santas" as Chloe refers to them. One day when she stays home alone from school, Chloe and her neighbour, Liam, discover that the gnomes are actually... alive. They have been protecting the planet from menacing little monsters called Troggs, who have invaded the house through a portal from another world. Chloe, Liam and the gnomes will have to team up to fight the Troggs and save the world from being invaded. and her bookshop is not doing well financially. In an attempt to bring the family closer, she takes the family to a Halloween costume party. The night doesn't go according to plan and the family find themselves in the back of an alleyway, cursed by a witch. The curse makes them turn into the creatures they were dressed up as: Emma becomes a vampire, Max becomes a werewolf, Fay becomes a mummy and Frank is one of Frankenstein's monsters. The family must stick together to find the witch and have her turn them back to humans before it's too late! The sequel to the 2012 animated film, Tad the Lost Explorer, is just as adventurous, funny and action packed. Tad, the construction worker, is now studying towards becoming an archeologist after his adventures in the first film. He is in love with Sara Lovrof, an explorer who is researching the mystery surrounding King Midas' necklace. The wearer of the necklace will have the power to turn anything they touch into gold. But when Sara is kidnapped, Tad and his sidekicks must race to save her and make sure the necklace doesn't fall into the wrong hands. Discover the real life of the boy who become an English literary favourite – Christopher Robin. When his dad A.A. Milne comes back from fighting in the war, Milne sees himself as a traumatised playwright with no purpose. He moves his family to the countryside to gain inspiration for a book that will make people see the injustices that are still prevalent after the war. However, it is his son, Christopher Robin, who inspires him to write a children's book about a young boy and his teddy bear, Winnie-the-Pooh. This is a heartwarming story about a family that gained hoped and gave it to the rest of the world. Age restriction: 10 - 12 PG. Warning: A.A. Milne's character experiences some very unpleasant flashbacks to the war, including bodies buried among leaves. The scenes are over in a flash but may disturb young and sensitive viewers. This marvel superhero film needs no introduction. After remaining at the box office number one spot for a 5th week, it's safe to say, Wakanda is forever. The film tells the story of a fictional African country named Wakanda that was never colonised. Instead, they have science and technology that is way ahead of the rest of the world. They chose to stay in isolation, not helping the rest of the world, even though they are very capable. When the king dies, his son T'Challa takes over the throne and the spirit of the Black Panther will live in him, guiding him to protect his kingdom from harm. However, T'Challa will discover a hidden family secret that could compromise the safety of his people and the world. This action sci-fi film is set in a dystopian Ohio in 2045. An orphaned teenage boy named Wade lives a very unhappy and simple life, his only source of happiness being a virtual reality game called The Oasis. For Wade, The Oasis is a world where anyone can live out their dreams and escape from the depressive and mundane lives they live. The creator of the game, now dead, left a broadcast message for the players of the game: "There is an Easter egg in the game. Whoever finds it will inherit half a trillion dollars." Eveyone wants to win the money but Wade gets really close, and is noticed by authorities. Soon a man-hunt for him begins. Ten years after the first war against the Kaijus, it seems as though someone has opened the Breach and the Kaijus are destroying the planet once again. Stacker Pentecoster's son, Jake, has no intention of becoming a Jaegar like his legendary father, but with more Kaijus attacking the Earth, he unwillingingly joins the force. The Jaegars will have to train and fight hard to eliminate the Kaijus, and the rogue Jaeger could end the world as we know it. Which movies are your kids looking forward to seeing this holiday? Tell us by commenting below.